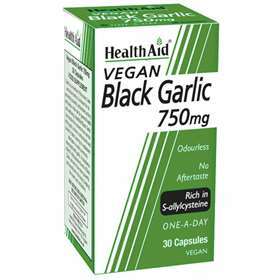 HealthAid Black Garlic is know as an extremely powerful antioxidant and for contributing to general all-round health and well-being. Black Garlic contains a substance called S-allylcysteine which is only found in black garlic. S-allylcysteine helps the body maintain a healthy heart, and circulation. This makes black garlic twice as nutritious than normal white garlic. Helps the body maintain a healthy heart, and circulation. Beneficial to maintaining all-round health and well-being. Sweet and no aftertaste or smell. Suitable for those who follow a vegan diet. Children over 6 years old: Take one capsule daily with water after food. Adults may increase intake to two capsules a day if required. Bulking Agent (microcrystalline cellulose), Black Garlic Extract (allium sativum), Capsule Shell propyl methyl cellulose (HPMC), Anti-caking Agent (silica, veg. magnesium stearate).